Cutting-edge science projects will benefit from a £300 million boost as part the government’s long term economic plan. This will create £150 million for the economy every single year after Science Minister sets out ambition for British science to be best in world. 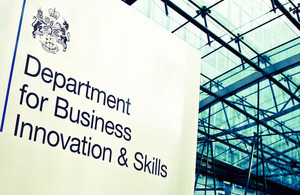 Cutting-edge science projects to drive innovation, growth and create jobs in the UK’s high performing science sector, will benefit from a £300 million boost as part the government’s long term economic plan, Science Minister David Willetts will announce today (11 March 2014). Investment in science is a crucial part of this government’s long-term economic plan. It’s about investing in our future, helping grow new industries and create more jobs – and that will mean more financial security for people across the country. These investments will see British scientists and businesses working together on some of the most exciting scientific projects of the future. The UK is 1 of the most productive science nations in the world - with only 1% of the world’s population we publish 16% of the world’s top quality research. And every £1 spent on research generates 50p for the wider economy every single year after. Today’s (11 March 2014) announcements also build on the £270 million investment in quantum technologies announced by the Chancellor in his Autumn Statement last year (2013). Quantum technologies create entirely new ways of communicating, measuring and processing information that are beyond the capability of existing systems. They already deliver satellite navigation, data storage and encryption – the industries of the future will be built on these capabilities and Britain will be at the forefront. International collaboration is central to scientific progress and is essential if we are to deliver projects on the scale of the Square Kilometre Array, the European Spallation Source and the M3 Space Mission. Many scientific projects can only be pursued through such large scale collaboration and it is great that the government has decided that the UK will play its full part. Investment in these projects is also an investment in British innovation and in the creation of sustainable economic growth built on our world leading science. British companies are already benefitting from the UK’s role as a global leader in science and innovation, and especially participation in the European Space Agency (ESA) Space Science programme. Astrium UK were awarded a contract in 2012 to lead the Solar Orbiter mission to study the Sun, and to build the spacecraft. UK participation in the next ESA space mission will further increase the number of space sector jobs and bring wider economic benefits to the UK economy. Innovative British firms, like Airbus, also have a real opportunity to play a role in providing the technological and manufacturing processes to meet demands of these cutting edge projects, directly generating economic growth and securing several hundred jobs. UK science is quite literally reaching for the stars and opening up galaxies of opportunity for British firms by investing in these projects. We’re delighted to see this clear commitment to our international partners to invest alongside them in these world-leading scientific activities. The facilities being developed not only push forward our scientific understanding but will also deliver results that can have an impact on our everyday lives. It is involvement in these sorts of projects that will keep the UK at the forefront of global science. We welcome the investment in scientific infrastructure announced today (11 March 2014) by the government and the access to world class facilities and equipment this will give to researchers in the UK. The global and UK economies and the well-being of nations and individuals are dependent on the chemical sciences. If we are to resolve global challenges - from developing and securing sustainable energy supplies to tackling antibiotic resistance and understanding and ameliorating climate change – then long-term investment in our world-leading scientific base is essential. This is a welcome step in the right direction and we look forward to the forthcoming long-term strategy for science and innovation which the government will publish later this year (2014). Everyone can appreciate the primary goal: PLATO is about establishing where our Earth and Sun sit in the scheme of the universe as a whole. The mission is not just a big step for space astronomers but what it sees will be used to exploit ground based telescopes as well. The whole astronomy community has something to gain. For more detailed information on The European Spallation Source and the Square Kilometre Array please contact the Science and Technology Facilities Council. Contact – Jake Gilmore, Media Manager, STFC, jake.gilmore@stfc.ac.uk Tel: 01793 442092. An infographic highlighting how the UK punches above its weight in global science is available to view here- http://www.flickr.com/photos/bisgovuk/13059061204. Subject to the completion of international negotiations, the UK will invest around £100 million in the Square Kilometre Array and around 10% to the construction costs of the European Spallation Source, about £165 million up to 2020 to 2021. Science and innovation are proven to be key drivers of economic growth and jobs in the UK, with economists estimating that 70% of economic growth in the long term will come from innovation. It’s evident that firms who are innovative and persistently invest in research and development are more profitable, more likely to export and less likely to fail. Government has protected the £4.6 billion science ring fenced budget and now have sustained capital investment in science guaranteed at £1.1 billion a year, year after year to 2020.